Time will be the true test, but on regional relations the likely next Uzbek president looks to be making progress. Uzbekistan seems to be keeping up the good neighbor act, and while only time will tell if the death of Islam Karimov marks a true change of course, in the interim Tashkent’s softening toward the state’s neighbors is encouraging on a regional front. A month ago, Bruce Pannier reflected for RFE/RL on “Uzbekistan: The Suddenly Good Neighbor” and last week he spoke at an event hosted by George Washington University’s Central Asia program to much the same effect. Uzbekistan, Pannier said, seemed to be softening on the edges while hardening at the core. 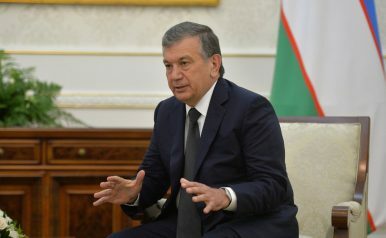 Interim President Shavkat Mirziyoyev, Pannier said, “moved fairly quickly to diffuse” the immediate tensions on the border with Kyrgyzstan by releasing the 4 Kyrgyz workers who had been detained by Uzbek troops on Ungar-too, a mountain on a stretch of contested border territory. Though Mirziyoyev did not attend the CIS summit in Bishkek, Abdulaziz Kamilov, the Uzbek foreign minister did, arriving a day early for talks with Kyrgyz President Almazbek Atambayev on September 15. By the 18th, Uzbek troops had withdrawn. On October 1, Kyrgyzstan’s deputy prime minister led a delegation on a friendship visit to Andijan; and by the end of the month, the Uzbeks had reciprocated, sending a delegation to Osh. Then reports, starting in Uzbek media, said the two states were in serious border demarcation talks. Those talks have led to a provisional agreement on 49 non-demarcated sections of the Uzbek-Kyrgyz border. Similarly, Pannier noted that reports in Uzbek media said the Uzbeks were also in talks with the Kazakhs on demarcation. Uzbekistan’s relations with Tajikistan under Karimov were positively dismal, but there too, there has been improvement. Again, Foreign Minister Kamilov was dispatched at the end of September and there was talk of resuming normal rail traffic and possibly a flight between Dushanbe and Tashkent. In an interview with a Tajik TV program, Kamilov said it was time to renew “long-interrupted” relations. The issue of regular air traffic between the two Central Asian capitals is particularly interesting. There haven’t been flights between the Tajik and Uzbek capitals since 1992. And here — like the border talks with Kyrgyzstan — there appears to be real movement. Asia-Plus, a Tajik news source, reported today that the Minister of Transport said a draft agreement between Tajikistan and Uzbekistan on direct air traffic was in the works. A cynic may say Mirziyoyev is painting a very diplomatic picture of himself ahead of the December 4 elections. He’s expected to win, regardless, but getting the population on board wouldn’t hurt the new regime. The true test of this regional softening will come as the years roll by.